MANUFACTURER: Town and Country Surfboards, Byron Bay NSW. Fiberglassed foam blank, 1/16'' redwood stringer, fin box, full blank spray, left hand plug. Tail: rounded square with chamfered pod and subtle flyers. 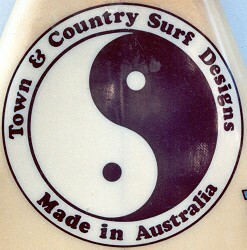 Large Town and Country Surf Design - Made in Australia with Ying/Yang circle in black and white at nose. 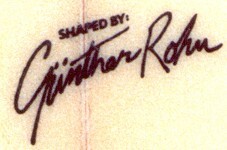 Small Shaped by Gunther Rohn, black text and script. 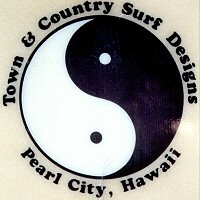 Small Town and Country Surf Design - Pearl City, Hawaii with Ying/Yang circle in black and white. Two large Town and Country - Australia, black and blue on forward rails. Deck: GR 5'10'' x 19 1/2'' at tail along the stringer. Deck : Full board white spray. Bottom: Full board white spray. BOARD HISTORY: Donated by John McInnes in 1993 - original condition. 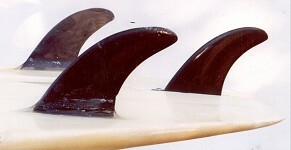 An early copy of Simon Anderson's thruster design, featuring wide tail, no-nose and the then common channels. See 1983 Town and Country Quad Fin #238.